2/3 to 3/4 cups water, warmed to 130 degrees F.
In the bowl of a stand mixer, combine all 3 flours (11 oz weight total), yeast, salt, cocoa powder, sugar, molasses, butter and caraway seeds. Add the hot water gradually, stirring until well blended. Dough should not be too sticky. Attach the dough hook, put the bowl on the stand and knead for about 8 minutes. If dough is too dry as it kneads, add a tiny bit of water. If it is too wet, add a little flour. Dough should feel pretty firm, smooth, and elastic once kneaded. Transfer dough to a oiled bowl and turn so that dough is lightly coated with oil. Cover and let rise for one hour. After dough has risen, divide it into 5 chunks. Preheat the oven to 450 degrees F. Have a parchment lined heavy duty baking sheet ready to go. 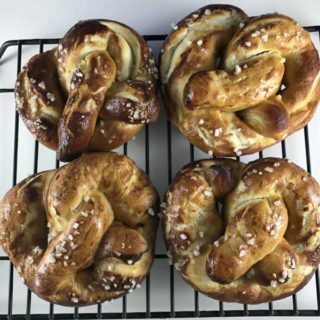 Shape each piece of dough into a 24-inch rope and form into a pretzel shape. Working one piece at a time, put the shaped pretzels in the boiling water for 30 seconds, then lift it out with a slotted spatula and put on a parchment lined baking sheet. Bake for about 12-14 minutes at 450 degrees F. Transfer to a wire rack and let cool or serve warm.